Resolve's human scale and ease of use reflect its fundamental principle: An organization's success starts with each person, so it's critical that everyone be provided the capabilities to do their job most effectively, whether it's collaboration or individual tasks. Resolve made a lot of breakthroughs. 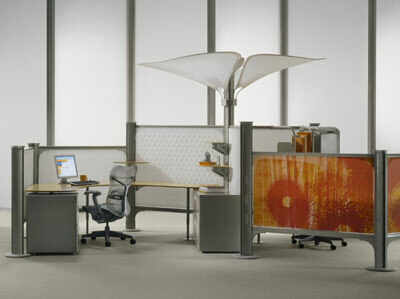 Its flexible and unique geometry breaks down the repetitive cells of square cubicles while actually offering a higher density of desks. Big companies like that. It was a pole based system, distributing power and cabling overhead rather than buried in wall panels. It introduced a whole host of new materials and space making devices, many that allowed the occupant to actively adapt their workspace to the tasks at hand. 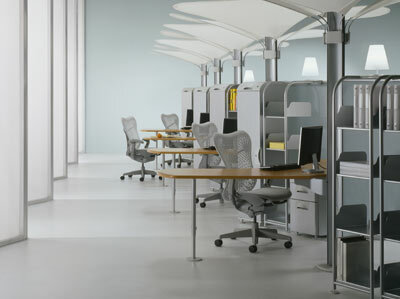 But more than any of these it had the potential for making much more humane workplaces than conventional cubicles. 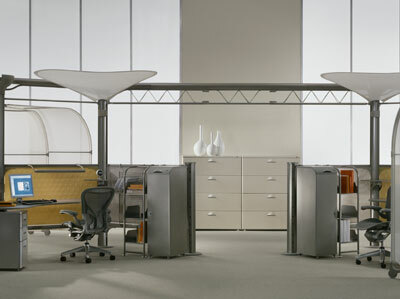 There are many good resources about the system on the Herman Miller site, so to learn more about it follow the link. Granted this may be much more than a small office needs, but reading about it is useful. They have thought a lot about the way people work, and they discuss it in framing their product. I'm going to try to post or link to a great little video where Ayse Birsel explains her concepts for the system.